Stop the Crash hosted it’s Latin America Launch today in Santiago de Chile, bringing the global partnership to the region to promote the latest in life saving crash avoidance technologies. 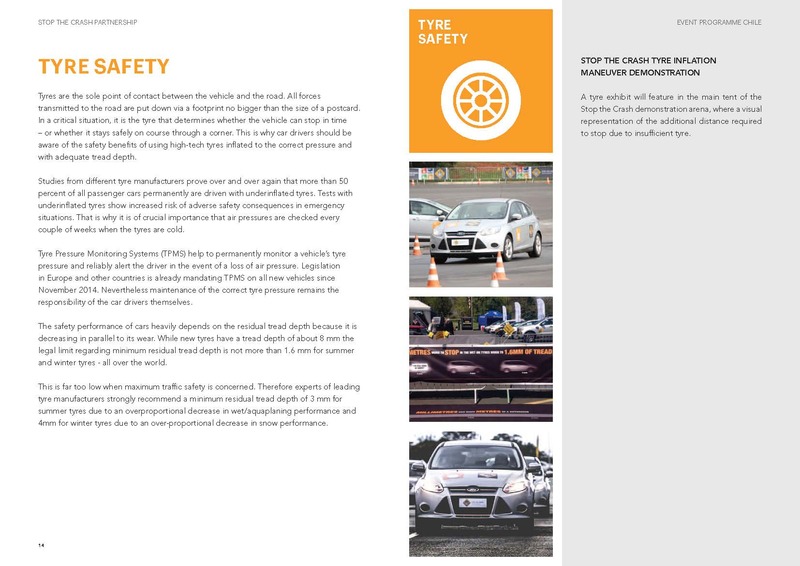 Following the global launch of Stop the Crash at the the 2nd Global High Level Conference on Road Safety in Brasilia in November 2015, the Stop the Crash Partnership has been holding a series of events across the globe promoting the importance of active safety systems. Today’s Latin American launch specifically focused on the implementation of Stop the Crash technologies in the region and took place with support from the UN Economic Commission for Latin America and the Caribbean (ECLAC) and the Chilean Ministry of Transport and Telecommunications, featuring demonstrations of electronic stability control (ESC), autonomous emergency braking (AEB), anti-lock braking system (ABS) for motorcycles, and tyre safety. The campaign recently hit a significant milestone in April with the adoption of a United Nations (UN) Resolution which specifically invited member states to adopt active safety systems as standard. Following the vehicle demonstrations at Stop the Crash, Global New Car Assessment Programme (NCAP) in partnership with ECLAC hosted a Regional High Level Road Safety Seminar on Vehicle Safety which featured representatives from ECLAC, Automobile Club of Chile (ACCHI), and the FIA Foundation. 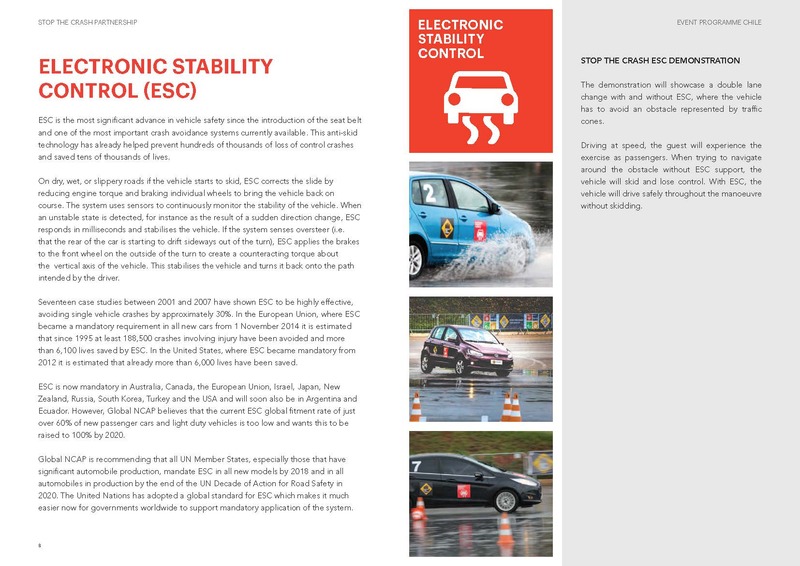 ESC is an anti-skid technology that can prevent loss of control crashes. ESC is the most significant advancement in vehicle safety since the introduction of the seat belt and one of the most important crash avoidance systems currently available. 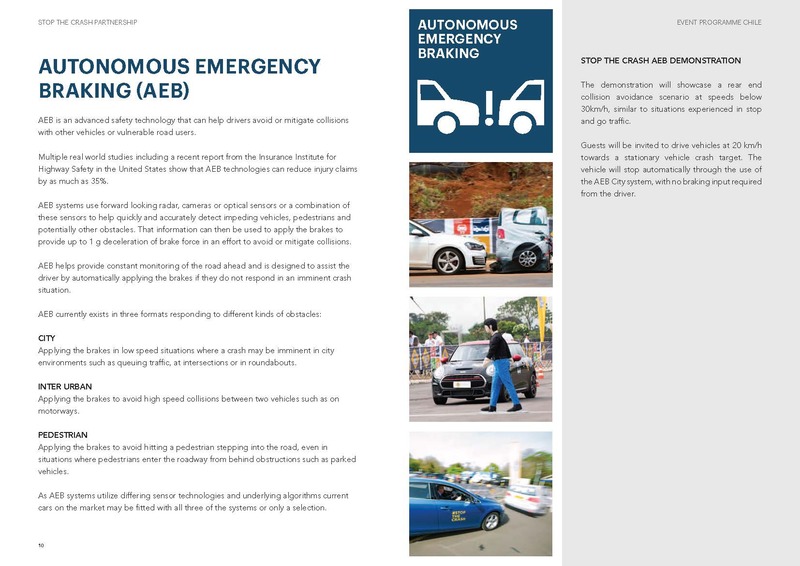 AEB is an advanced safety technology that can help drivers avoid or mitigate collisions with other vehicles or vulnerable road users by automatically applying the brakes if the driver does not respond in an imminent crash situation. 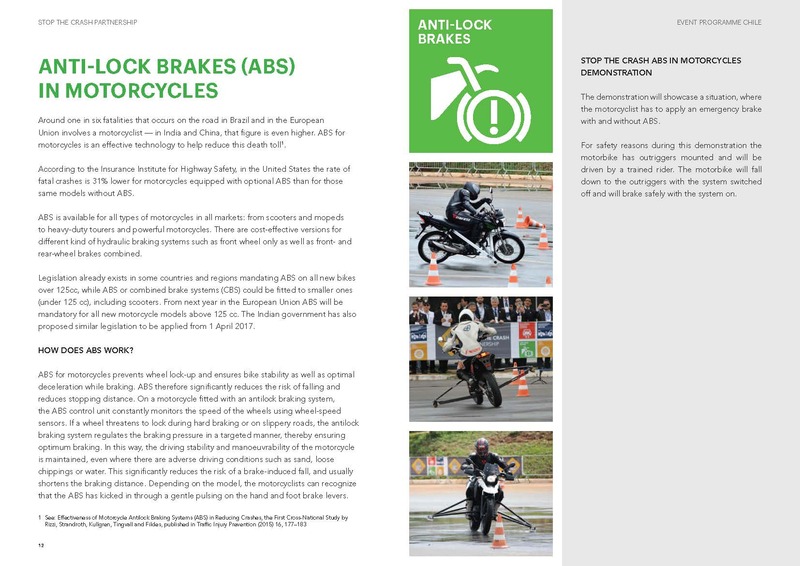 ABS for motorcycles prevents wheel lock-up and ensures bike stability as well as optimal deceleration while braking.